While driving the vehicle, always use seat belt for your safety. Same is applicable for all passengers. Avoid cranking of engine for more than 30 seconds. A gap of 2 minutes should be observed between successive attempts. Don't start the vehicle by pushing it. Always start moving the vehicle in first gear. Don't adjust the seat belt while driving. Always keep the vehicle in neutral gear while engaging and disengaging the reverse gear. On bad surfaces reduce your driving speed and drive cautiously. 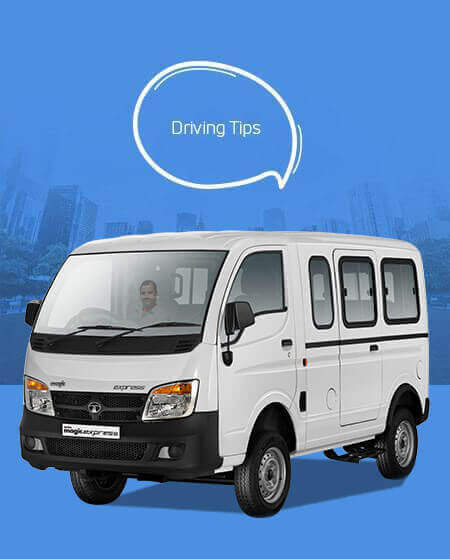 While travelling on inclines, change into a lower gear to get the required pick-up. While going down the slopes, don't proceed in the neutral gear. You may reduce the speed by releasing the accelerator. Make the deceleration easier by using the brakes, but don't apply brakes for too long to avoid dangerous overheating, which in turn reduces efficiency of the brakes. Change to a lower gear, to increase the engine braking effects. Change to a lower gear while turning, slowing down and before applying the brakes on wet roads. Before taking a curve, gently release the accelerator and if required, change into a lower gear. To get rapid pickup while overtaking, engage a lower gear in order to have the necessary power at once. Don't press the accelerator when clutch is pressed down. This drastically reduces the clutch life. Don't jam the brakes on wet surfaces, on un-metallic or slippery roads. Do not use clutch pedal as a foot rest when driving. This will cause premature clutch lining wear. Don't coast vehicle i.e. drive with the engine switched off. This is dangerous and affects the life of gear box. Don't use mobile phone while driving for safety of yourself and other road users. Always park the vehicle with the parking brakes 'ON'. Don't use kerosene as a fuel, it reduces engine life and fuel pump life.